SPRINGDALE (KFSM)--Last season, Shiloh Christian achieved its main objective but still left with an empty feeling. The Saints beat Pea Ridge in week ten before falling to Stuttgart in the 4A first round. "Now we can move on and focus on one game at a time. We want that conference championship," senior Jaret Russ said." Jeff Conaway has been impressed with the Saints so far, thanks to one group of players. "Our strengths will be our senior leadership. Those guys are a band of brothers, they love each other. They practice hard for each other, they sacrifice for each other. And honestly I believe that is going to be this team’s greatest strength," Conaway said. "We’ve been really focusing on taking some of the leadership off the coaches and on to the seniors," Preston Hall said. "So that’s a thing we’ve hit on all summer that we’ve been working towards." 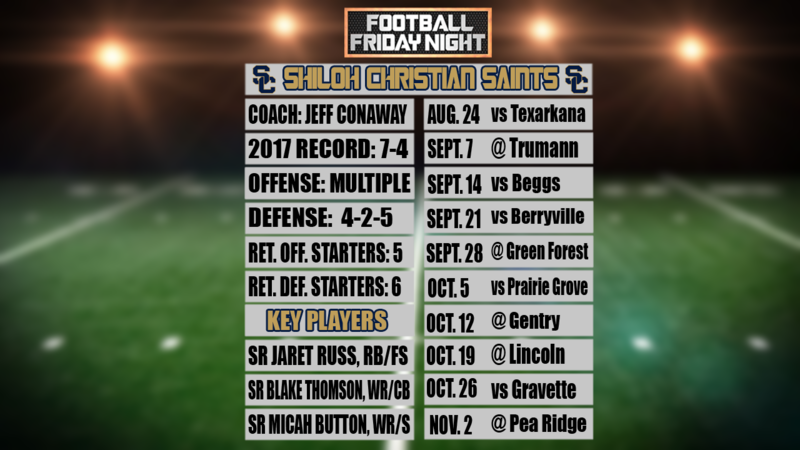 Shiloh Christian finished 7-4 last fall, but a week nine loss at Gravette cost the Saints a share of the 4A-1 title. With a slew of returning wide receivers and running backs, the team is confident. "Definitely think our skill players, they’re top notch. I mean we got guys like Jaret Russ, Micah Button, Blake Thomson, Truitt Tollett, Preston Hall, Logan Raben I mean all those guys. You could just name them forever," offensive lineman Logan Kallesen said. "We got a lot of talent in the skill area. It’s really nice being one of the skill guys myself to have somebody. I just know I’m comfortable, I’m not alone," added Russ. Shiloh opens by hosting 5A school Texarkana on August 24.